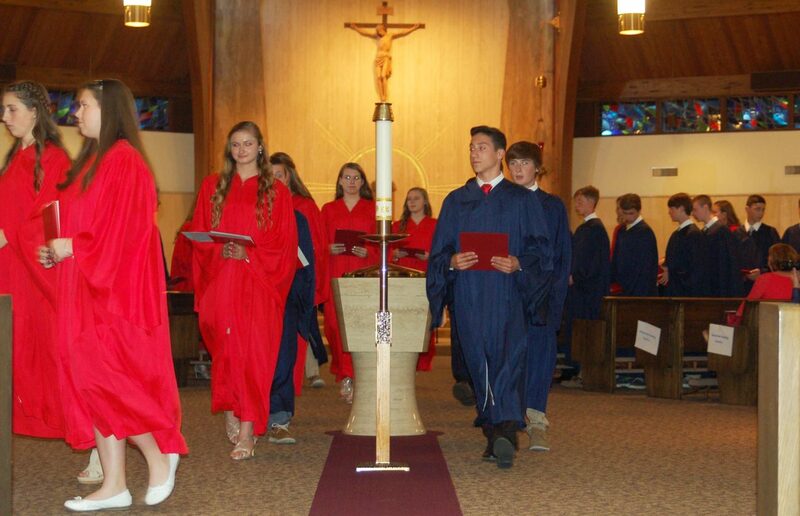 Students of Holy Cross Regional Catholic School receive recognition for eighth grade graduation June 14 at St. Eleanor Church, Collegeville. 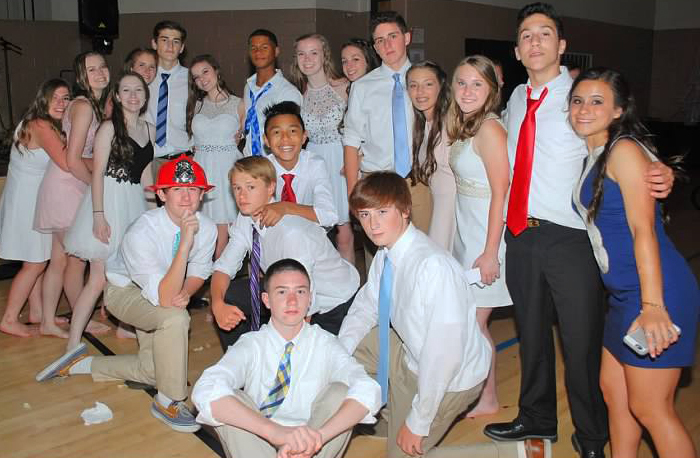 The eighth grade students graduating from Holy Cross Regional Catholic School in Collegeville celebrated their last day at the school with a Mass, reception and dance on June 14. Family and friends cheered as the names were announced for the 69 students entering the Parisian-themed party hosted by the parents of current seventh graders. Awards such as perfect attendance, reading olympics and FitnessGram were presented to deserving students. Eighteen altar servers were also recognized by the Knights of Columbus and the Serra Club for their faithful service to the school’s sending parishes, Sacred Heart in Royersford and St. Eleanor in Collegeville. Juliana Zeller and Kathleen Schiele received the Father John Franey and Father Thomas Doyle Award for exhibiting a positive attitude. For making the greatest effort to improve throughout the year, Sarah Abruzzo received the Father John O’Neill Award. Two students, Grace Zeller and Jacob Zavrotny, demonstrated Christian values every day and were honored with the Elizabeth Beiber Award from the St. Eleanor Women’s Guild. Lauren Keefe was recognized with the St. Cecelia Music Award for outstanding service to the Liturgical Music Ministry. Liam Cotter won the Library/Media Award. Leadership and character awards from state Sen. John Rafferty were given to Jenna Booth, Julie Nentwig, Andrew McKeon and Colin Fuges. The following students took home awards for excellence in specific subjects: Edmond Park and Julia Patterson for religion, Liam Cotter and John Durrell for English Language Arts, Olivia Carton and John Durrell for mathematics, John Durrell and Grace Zeller for science, as well as Owen Ley and Catherine Mannato for social studies. The Excellence and Participation in Religion and History Award was given to Lauren Keefe and Derek Hammel. General Excellence was awarded to Liam Cotter and Outstanding Effort was presented to John Durrell. Collegeville’s Philly Pretzel Factory owner Mike Lanza presented an annual anti-bullying scholarship to Chloe Young for her empathy and service to others. Julia Patterson received the Perkiomen Valley Council Knights of Columbus Scholarship to Pope John Paul II High School. Claire Wiegand received the Pope John Paul II High School Award. Owen Ley received the prestigious Neumann Scholarship from the Connelly Foundation. Delaney Cordrey and Julia Nentwig received the Maguire Scholarship. Each of the scholarship recipients will attend Pope John Paul II High School in Royersford in the fall. Outstanding students Olivia Carton, Kathryn Teles, Killian Rush, Derek Hammel, Kathleen Schiele, Catherine Mannato also were granted scholarships. Students enjoy a school dance after their graduation from Holy Cross School.